Follow Jack into sleepy time with Jack’s Dreams Come to Life. Jack is searching for something to do. His friends Sadie and Jeep want to play with him, but he is a big dog now and can’t be bothered with puppies. So Jack finds his favorite tree and soon falls asleep. In his dreams Jack soon discovers he might not be that big of a dog after all. This is a cute story about a dog whose dreams get the better of him. He’s pushed aside his friends because he decides he’s too big to play with them now, and he learns a lesson through his dreams. The illustrations for this one are adorable and I’m certainly glad Jack is dreaming what he’s dreaming and not me. That would be a bit scary. 🙂 My one challenge with the book is that the reader doesn’t get to witness Jack doing anything with what he learns. Jack wakes up and is relieved to see that things in his world are normal, but then he doesn’t join his friends in play after that. Actually, Sadie and Jeep aren’t mentioned again after he ignores their request to play. I got to the end of the book and felt like there was a little bit missing. Despite that, it’s still a charming story brought to life by wonderful illustrations. 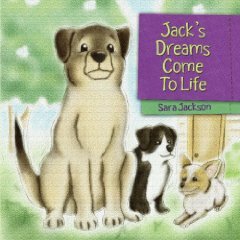 Any kid who loves animals, and specifically dogs, will most likely enjoy Jack’s Dreams Come to Life by Sara Jackson.